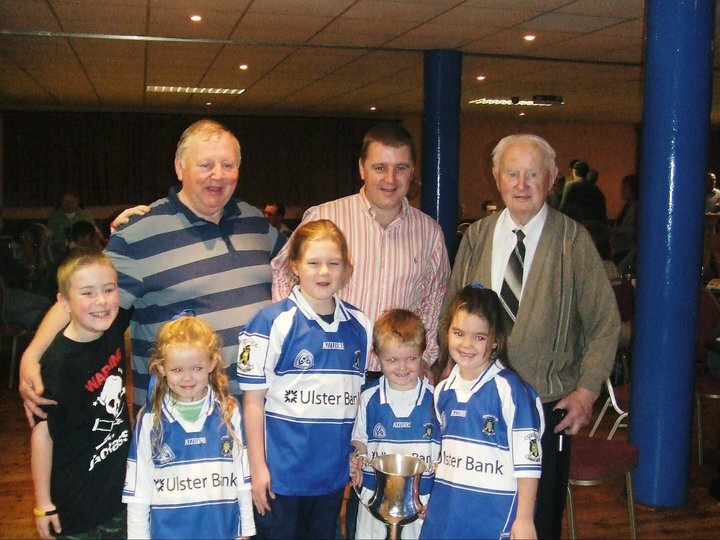 When the members of Mount Sion club met recently, it was to formally put to the floor the motion that the club pitch would be renamed in memory of its late life president, one Pat Fanning. Prior to the motion being dealt with, comments were invited and Jim Greene, the club’s very first All Star, spoke. His words were simple and succinct-our great club had had many great people in its illustrious history. But there was never one as great as Pat Fanning. No further comments were deemed necessary. The vote was unanimous, the meeting over. 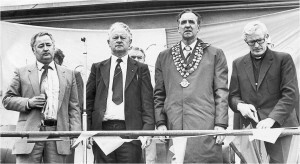 Padraig O’Fainin speaking at the Cnoc Sion CLG 50th Anniversary 1932-1982 from Mount Sion Gaa on Vimeo. Padraig O Fainin passed away on the 14th March 2010. He had been born “a subject of the British Empire” as he so jovially put it, in 1918 and he would leave a vastly different world in 2010. A world that had experienced two “great” wars and one that saw Ireland make the bloody transition from colony to republic. 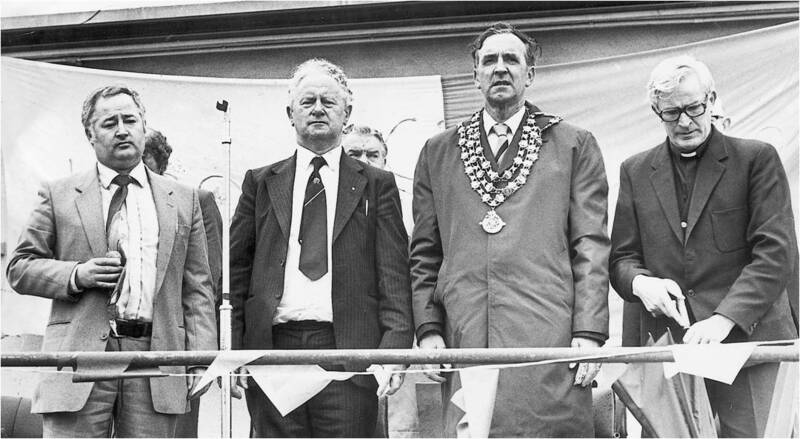 But it was in this transient world that Pat Fanning indeed made his mark, a mark that would indelibly affect all those who were privileged to know him, both locally and indeed nationally. When Pat left the Mercy Convent as a seven year old to enter the “boys school” of Mount Sion on Barrack Street, few could have imagined the influence that seemingly insignificant transition would have on the young boy. Though his father, a draper’s assistant on Thomas Street, was of the Parnellite mould and loved all things uniquely Irish, it was not until Pat entered the CBS that the fires of nationalist fervour that would shape his future thinking were first stoked. A love of our language, our land and our games were embedded in his psyche and formed the bedrock for all he held dear for the eight decades that followed. It was in the school then that hurling entered the world of Pat Fanning. In this “clubless” environment both he and his great friend John Keane were first exposed to the ancient game, a game that would devour both boys into manhood and a game that would forge a common bond between two men that was indeed unbreakable. The enthusiasm of such boys inspired the “magnetic personality” as Pat put it, of Brother Malone to propose that a club for these talented youngsters be founded. Acting upon this, Brother O’ Connor convened a meeting of like minded young men in a room in the monastery in 1932, and from this genesis, the club we see before us today, the club that would form the lifeblood of generations to come, was born. As a player Pat garnered his first taste of glory when, as a fourteen year old, he played on goal on the club minor team that beat Fourmilewater in the final of 1934. Interestingly, at the time of winning, the county board were insolvent and the club agreed to postpone the receipt of medals. Ten years later, when the funds were available, the board decided to belatedly present the medals to the minors of 1934! Pat however, was now embedded in administrative matters and decided as secretary of the club that the interests of our cash strapped club would be far better served if the mementos of victory were sold for a donation of ten pounds to club finances! The county board obliged and the boys of 1934 never got their medals! Seven county senior hurling medals and an inter county career followed. He was also selector on the 1948 minor winning team having been dropped from the senior panel following the Munster final victory that same year. His late, great brother Larry was dropped from the senior team for the All Ireland final of 1948, a demotion Larry never tired of telling me was because his “big brother was too fond of writing letters to the county board!” The golden era of 1957- 1963 was spent as county board chairman and selector of the senior team in the company John Keane as team trainer. This was the time and these were the people he recalls “with greatest affection.” A period that Pat recalled so fondly to his last days when reminiscing about Frankie and the men of Sion and the other heroes of that time would elevate him in his seat and set alight the fire in his eyes once more. As an orator, he had no equal, at least not in my experience. He had never wrote speeches, save for conference and convention where public record was a necessity. His words were spontaneous, sincere and profoundly inspirational. I sat in awe in team meetings and wept, rejoiced and grew as I hung on his every word, my being growing in stature with every sentence. His ability to express critical thought cased in the most uplifting form was a rare talent. By the time he was finished, you knew- everyone in the room knew- that you were indeed in the company of someone very, very special. His capacity for expression in written form was equally as impressive. His ability to put forward his case in writing was one which elevated the true Déiseach to national prominence in the company of sporting scribes. His tenure as President provided a national platform for his skills. His skilful handling of the removal of the ban has to be seen in the context of the Ireland of the time to be truly appreciated as a moment of diplomatic genius. Ireland teetered on the brink of civil anarchy on the Northern issue. The Association threatened to fissure from within and the future looked anything but secure. Yet, in his masterful deletion of the rule he thrust the Association forward, reinvigorated and revitalised with a brave new confidence yet he carried it on a bedrock of steadfast reassertion of core traditional Association values. These were the utterances of true, natural leadership. Words so sincere and so inextricably linked to the core principles of the GAA that they embedded in those who heard them a revised sense of self worth, a vastly heightened pride in their endeavours. The GAA emerged from his tenure a more unified and powerful movement, a movement unyielding to the threat of an occupying force in areas of our land. 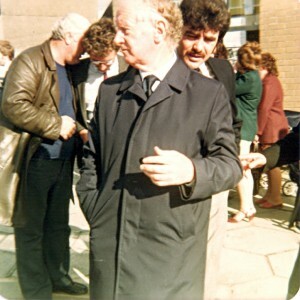 Pat Fanning visited Westminster and imposed upon those alien to our ethos, the very strength and intransigence of our people in the face of military adversity. In an interview before he took presidential office, he declared that “we are strong but our weakness is that we don’t know our strength.” His tenure in office would be shaped by his endeavours to eradicate that “weakness.” He succeeded in doing so, raising a whole people by his word and deed. 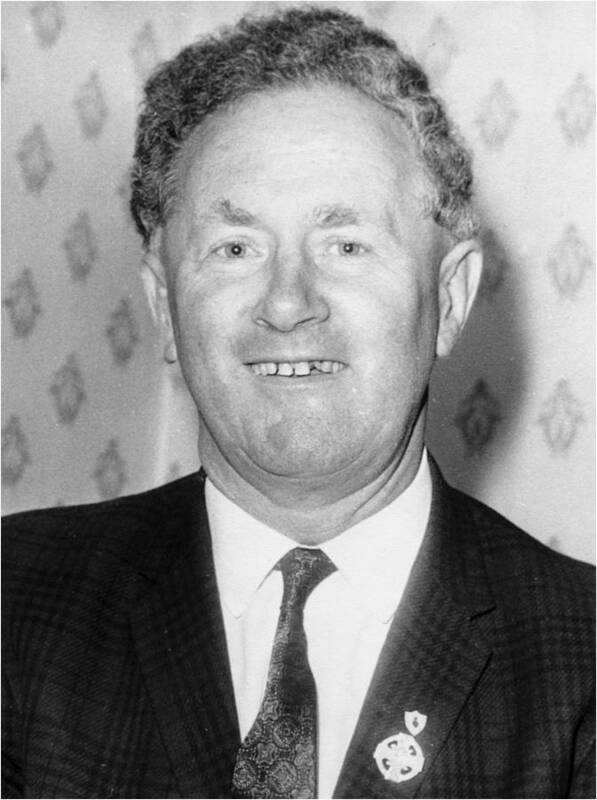 Though his achievements beyond the confines of his beloved club and school were many, Pat declared to me that the highlight of his life was, what he termed, “the story of Sion- the story of a small group of people coming together and forging a club, a club that would be known the length and breadth of our land.” Jay Drennan, writing in the “Gaelic World” in 1971, stated that Pat Fanning was “rightly rooted where the roots of every good President must be- in the club.” Drennan referred to our club as “his monument above all others.” Indeed it was, and by us gathering here today we ensure that it remains so, and by name too. The renaming of our club grounds would embarrass this humble man. But it too would thrill him, to know that a life consumed by a game that he declared “distinguishes us” might consume others who would follow him through the generations. Pat Fanning was a humble man. Pat Fanning was a gentleman- a friend to be cherished, a confidant to be sure of, an adversary to be feared- simply because he appeared unbreakable. But broken his body eventually was, ravaged by the excesses of Father Time. But the spirit of Pádraig Ó Fainín can never be broken, least not for those who knew him. His spirit will live in for he touched enough to carry the torch. By way of this page and plaque erected at his beloved Mount Sion, we are ensuring that as Mount Sion people will never forget Pat Fanning. If Mount Sion club was his monument, then, by token of this gesture, he becomes ours. Slán go fóill Déiseach, feicfimid thú in áit éigin eile lá amháín. Laoch, Cara, Inspioráid.